As I am suffering from fever and headache, I am unable to attend the class for two days. So I humbly request you to grant me leave for the same days. 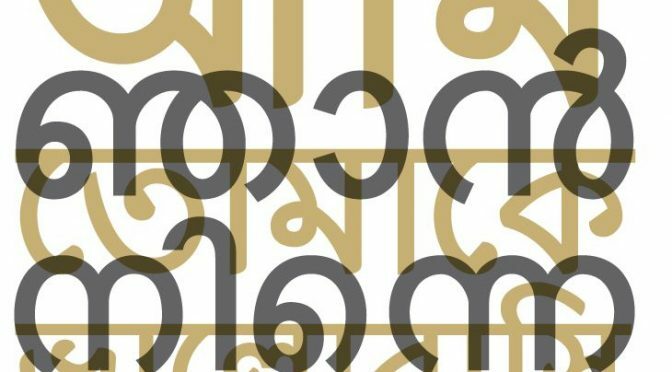 This is how a Malayali learned to write the foreign language. We wrote fever for tummy ache and even for heart pain. Every time we were sleepy after temple festivities that lasted long into the night, we wrote this letter on a lined paper plucked from the school notebook, and sent it through classmates in the neighbourhood. We only wrote; never spoke. Speaking English in public was — still is — considered inferior. You could say it’s taboo, but not because we’re in love with the mother tongue. For laymen, English is a pretentiously cool way for the petit bourgeois to show off, which of course, wouldn’t be tolerated. So, thou shall not speak English. Kerala may be the only place in the world where taxi drivers and tour guides conduct their businesses seamlessly in sign language. My Chinese friend, Chin Fun, who visited Kochi, told a hotel receptionist to deliver an English newspaper for a week. They made sure she read Mathrubhumi every day. As we passed the threshold of adolescence, we tried our hands at letters of a different nature. Manglish was the chosen language for love letters, for fear of getting caught by our Malayali parents. The dictionary became our best friend and found a special place in our lives, even claiming a home under the pillow. We discovered new words as we took chances with various heartthrobs. There was no study room in most Kerala homes in those days, so kids gathered around the dining table to complete their homework. Love notes were secretly written right under the nose of siblings and parents. We pretended to be doing homework while scribbling words of love on hidden sheets of paper. The risk was worth it, as long as we could make someone smile. Constant innovation in love letters would ultimately take us to the end of school life, when most students got busy writing goodbye ‘autographs’. That’s the time we poured our heart out publicly on coloured pages of the little books. Love blossomed and withered on these pages. Most autograph leaves looked like a graveyard of dreams. Like a footnote to Love’s Labour’s Lost. Salutations suddenly changed from ‘Darling Suresh’ to ‘Dear Brother’. Hope throbbed in some leaves where aspiring lovers perfume-sprayed their alphabets of emotions. Here are some gems fished out from Rajeev Nair’s autograph book, cast away from the prying eyes of his wife in their Karama apartment. A girl in hand is better than two in the bush. You will remain alive in my garden of memories. A true friend walks into your life when others walk away. Smile and smile and make miles and miles of smiles. Let not your thoughts wander into anything other than friendship. The last one sounded more like a warning to a mischievous lover. But the best one I could remember, from my own autograph book, was the pent-up frustration of my class VIII flame: ‘Man, never hop onto a moving bus or a smiling girl.’ She sounded distinctly jealous. Life in college opened up a new world of personal and creative freedom. Teachers were like friends who rubbed shoulders with us in party offices. They made us realise, life is beautiful and it’s okay to dream. We debated whether communism was a rationalist or a romantic ideology. Che Guevara and Nazim Hikmet gatecrashed our world of romance, revolutionising our thoughts. We quoted them extensively. My English professor Annie Raju was the most modern among them. She said there’s no better language than English to express your self, so keep writing letters. Malayalis knew it better than the Bard. She taught us the importance of salutations. They beckons the addressee to your world of emotions. The more personal, the better. Call them by name, she said. We soon replaced ‘Dearest Darling’ with first names. Like you call your wife at home. She also taught us silence was louder than words in the bible of love. A drawing could even be a better messenger than words, she preached. Thus, the Malayalis invented emojis!! And the lovers relished that personal touch. After graduation, it was time to pack and leave for Mumbai, New Delhi or Calcutta, the Malayali’s favourite migration destinations. In a Mumbai newsroom, Malayali journo Mohammed Ryaz wrote love letters to his Bengali senior Amala every day. She said Ryaz never erred on the emotional side, but a lot on grammar. She edited the letters and gave them back. Love educated Ryaz, and he now has a cabin in one of the leading newspapers in Mumbai. Amala is the mother of his two children. My friend Anu, who landed in Calcutta with a bag full of dreams and Marxist literature, fell in love much before he could pick up the meaning of ami tumake bhalobashi (I love you). Bengali was as much foreign to him as was English. What followed was an epic battle of language. He wrote, rewrote, restructured and repolished before calligraphing his emotions. The dictionary became his companion by day and night, replacing even leftist literature in his slingbag. He went on to write books and make a living of finding mistakes in others’ write-ups in a newsroom. Love letters, anyone? Anu is free to help. So are Malayalis like Rajeev and I. Buy two, get one free.